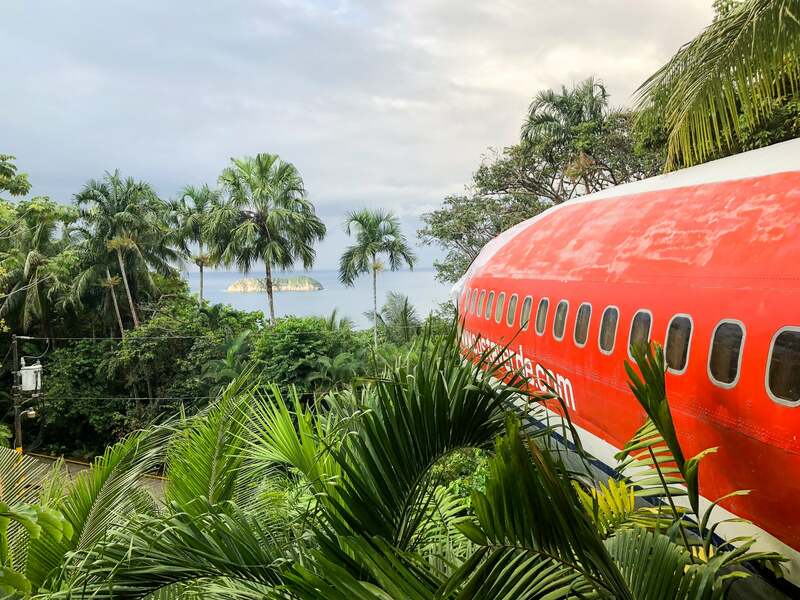 A unique jungle adventure to warm any AvGeek’s heart. 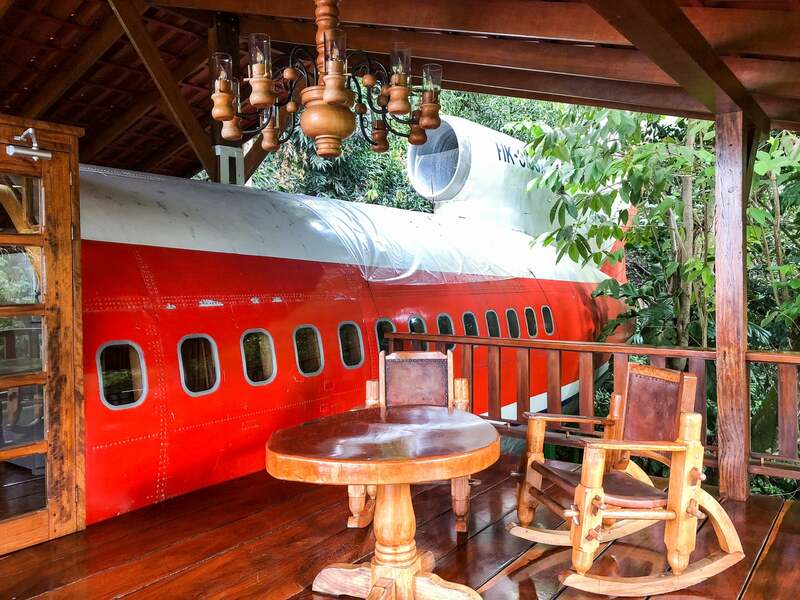 Pros: perfect for aviation enthusiasts, nature lovers and those seeking unusual accommodations. 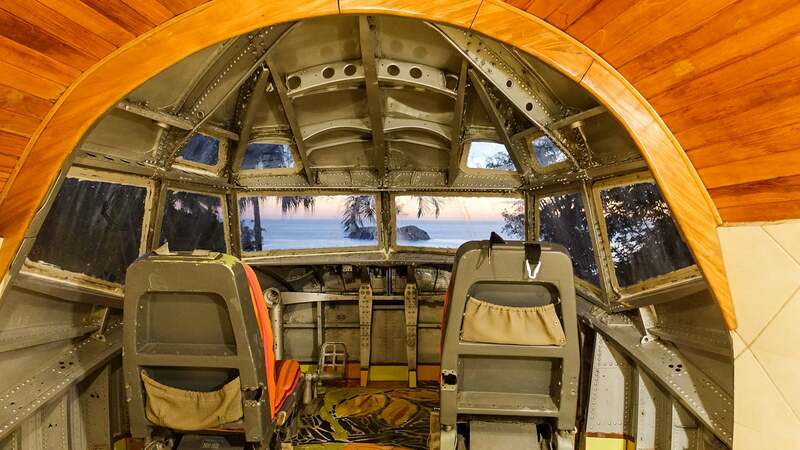 Cons: uncomfortable furniture, best appreciated by those who adore planes and/or wildlife. 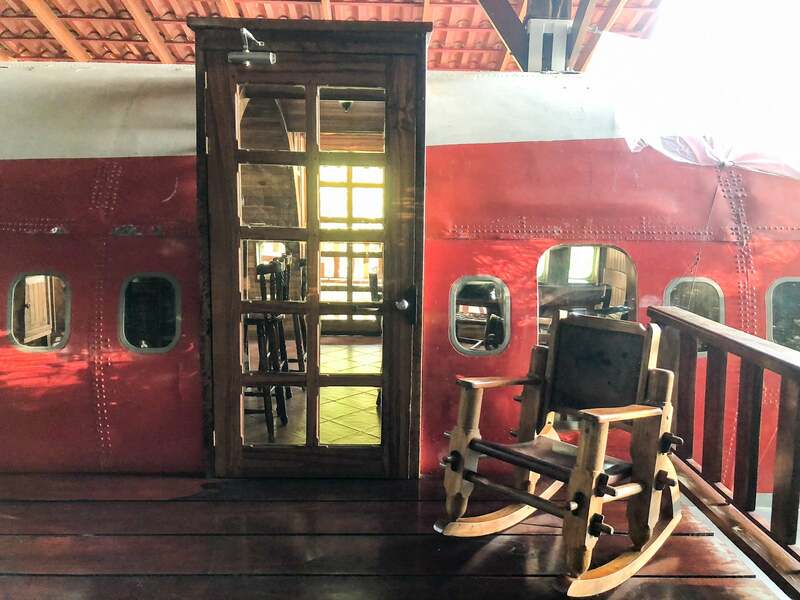 After writing about some of most unique hotels in the world for TPG, I made it my mission to visit several of them, starting with a stay at the 727 Fuselage Suite at the Hotel Costa Verde. 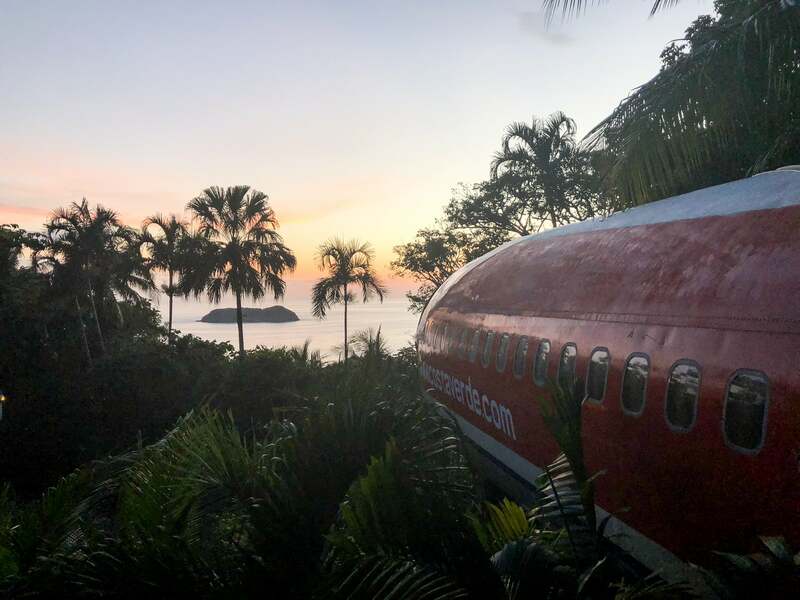 Though I’m definitely not an AvGeek (for me, planes are awesome, but moreso because they get me from A to B), staying in a retired 727 aircraft with ocean views in the heart of the Costa Rican jungle still seemed exciting and fun. 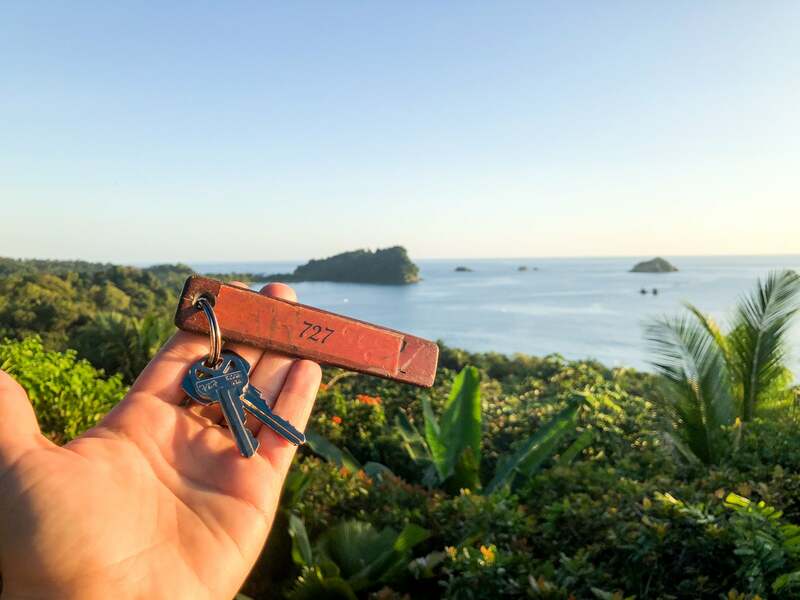 I made my dream a reality this past December when I headed to Manuel Antonio, Costa Rica, to see if the 727 Suite at the Hotel Costa Verde lived up to its rep as one of the most original hotels ever created. Not breaking news: You book a plane hotel exactly like you book most any other hotel or flight, online. 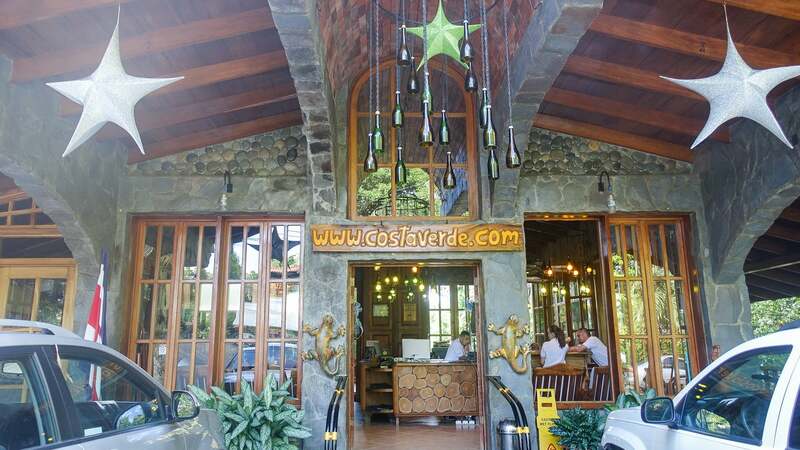 I booked the suite a few months in advance on Costa Verde’s website. My dates were specific, and there was only one 727 Fuselage Suite, so I wanted to make sure I got to stay in it. Rates including tax were $406 per night during the high season when I visited, but that price is for a two-bedroom suite that could sleep six, so not a bad deal at all. (In low season, rates start at $260 per night.) I had to prepay and received a confirmation shortly after payment. This aircraft didn’t fly with a loyalty program, but I used my Chase Sapphire Reserve to pay, earning me 3x points on this travel purchase. 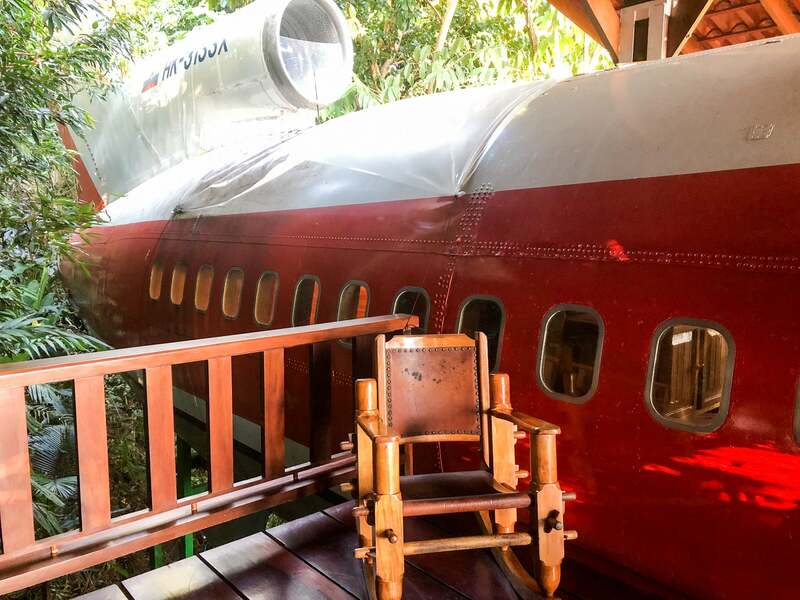 If the suite is booked on your chosen dates, the second best option is the Private Cockpit Suite, the front section of a McDonnell Douglas MD-80, accessed by a suspension bridge in the midst of the jungle landscape covering the property. 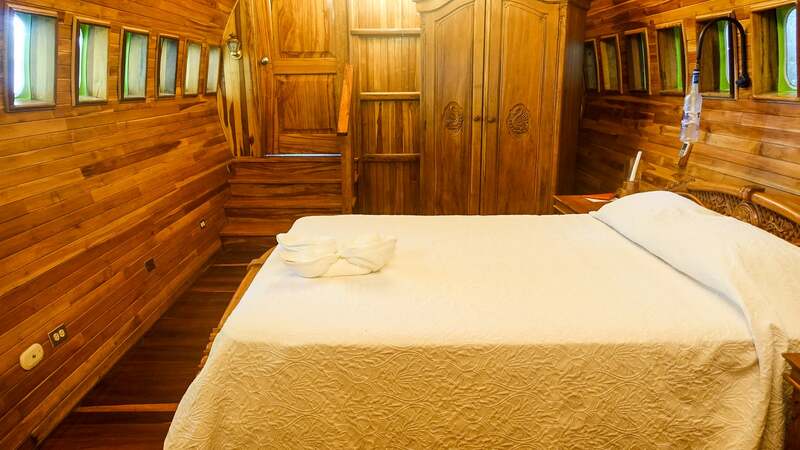 Prices for this room start at around $210 per night. 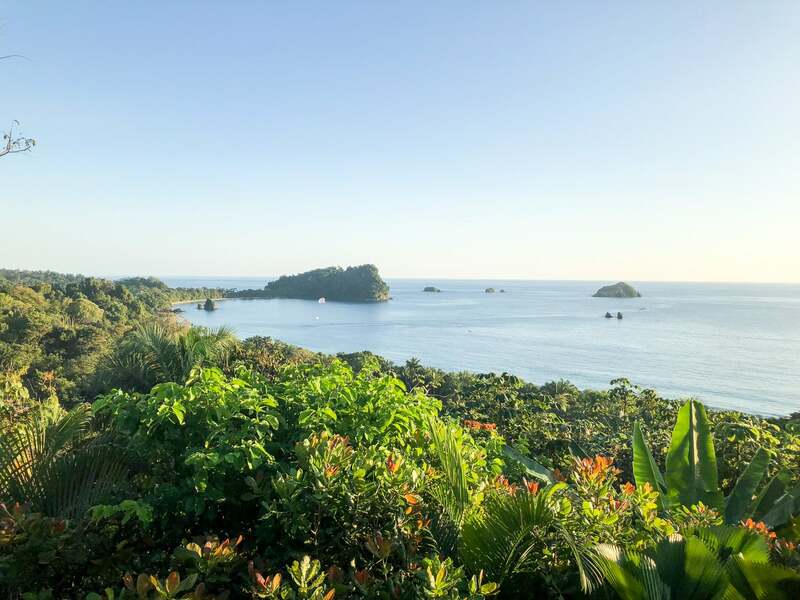 After an hourlong drive from Uvita, Costa Rica, I was sure nothing could top the private, glass jungle huts with breathtaking rainforest and sea views of the previous hotel I’d stayed at. But I was in for a surprise. After weaving up the winding, hilly road, I pulled into the main building, guarded by a few (fake) alligators. A friendly staff member greeted me in the small, teak-covered reception area, confidently telling me I had the best suite in the place, 727. I was shown a map of the hotel complex, which was enormous, with several different buildings, pools and restaurants. After getting the key, I was able to drive and park close to the suite, which wasn’t too far from reception. 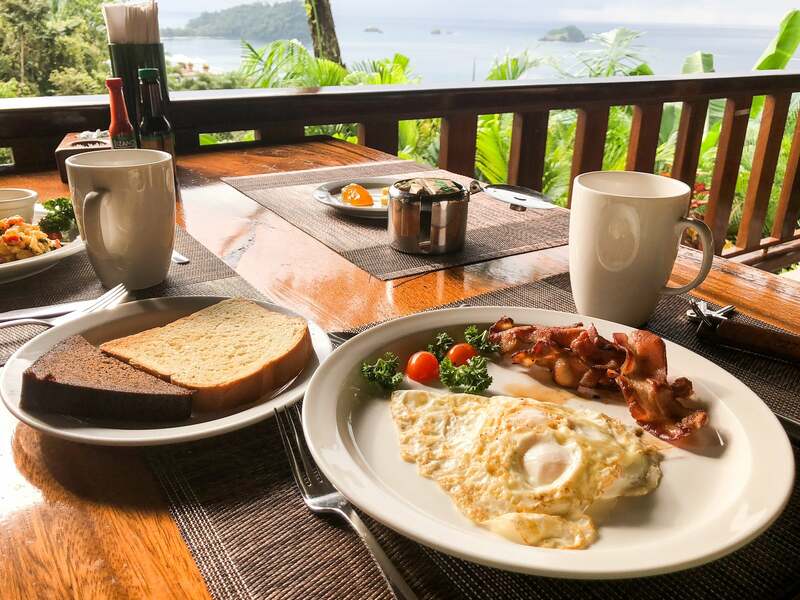 The hotel sits just off the main road in Manuel Antonio, bordering Manuel Antonio National Park. 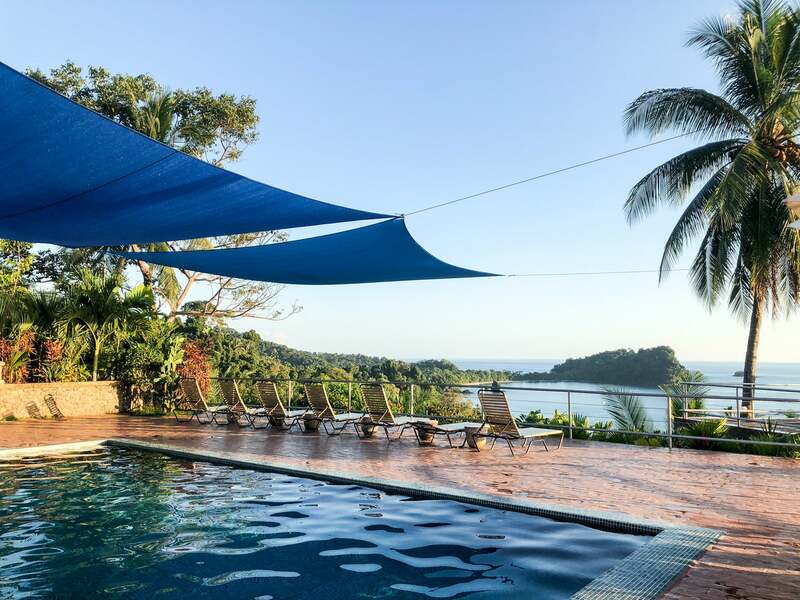 Although it’s close to restaurants, supermarkets and bars on the main road, the hotel is really nestled in the heart of the jungle, with stunning ocean views and a true feeling that you’re really out in the rainforest. 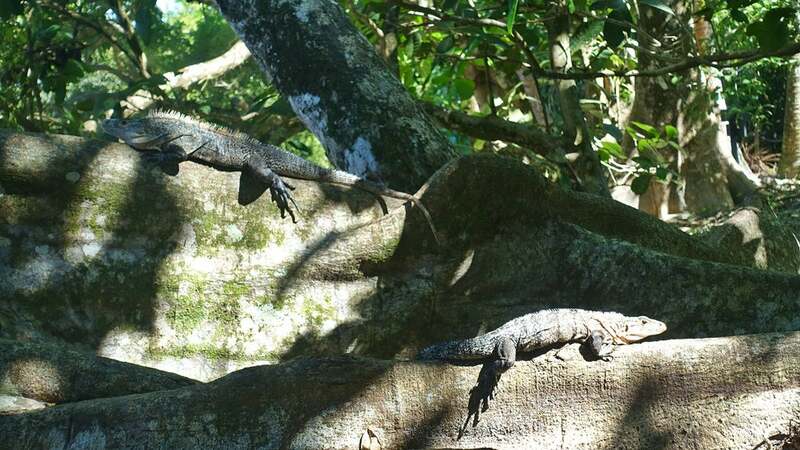 I saw a variety of wildlife throughout the property, like toucans, lizards, monkeys and even a sloth. 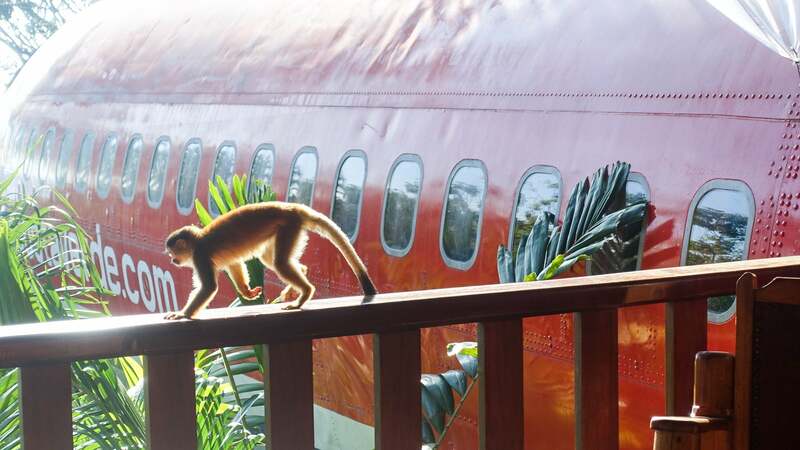 In fact, the monkeys loved to hop around the plane suite, so we had energetic visitors when we least expected it. Renting a car is recommended, as the hotel is about a three-hour drive from San Jose Airport (SJO). Although a four-wheel-drive car isn’t required to access the hotel, it’s a good idea. And, if you’re into adventuring off the beaten path, it’s pretty much a must. From the hotel, I could walk to the beach, to the national park and to many nearby restaurants and bars. It was easy to use Uber and taxis, too. First, a little history. 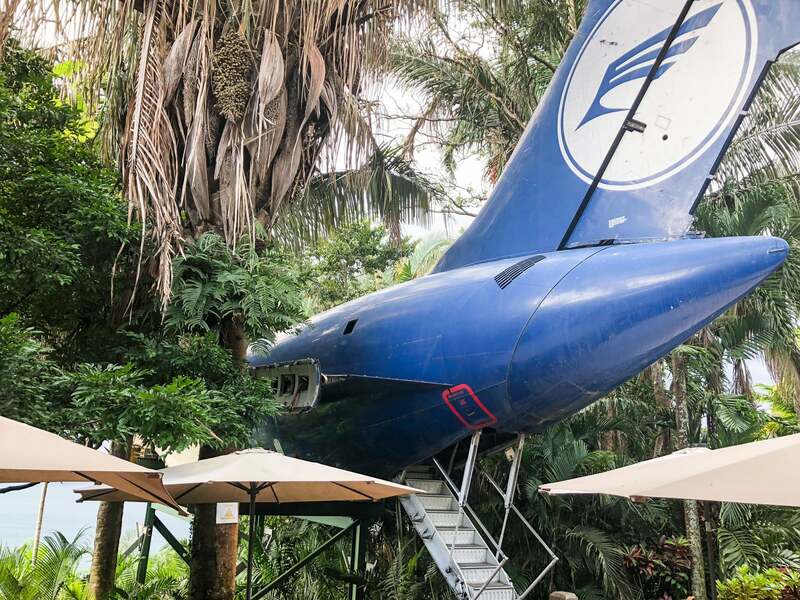 The suite was created with a Boeing 727 airframe that dates back to 1965, which was once used by South African Airways and Avianca. 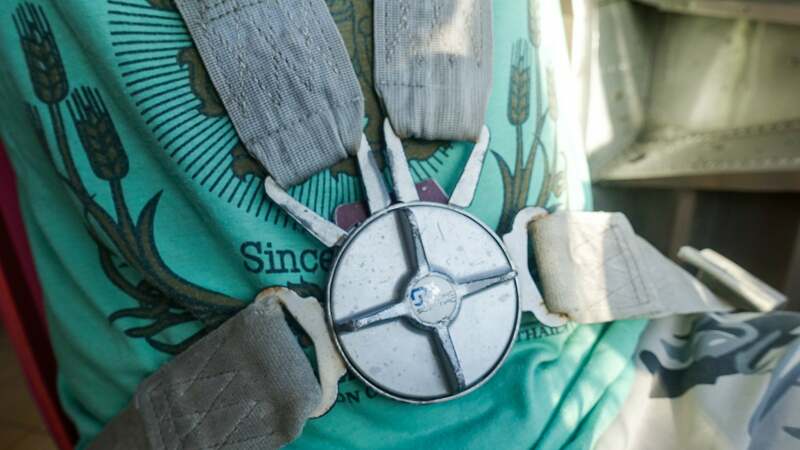 The pieces of the plane were transported to the hotel from San Jose Airport in large trucks. 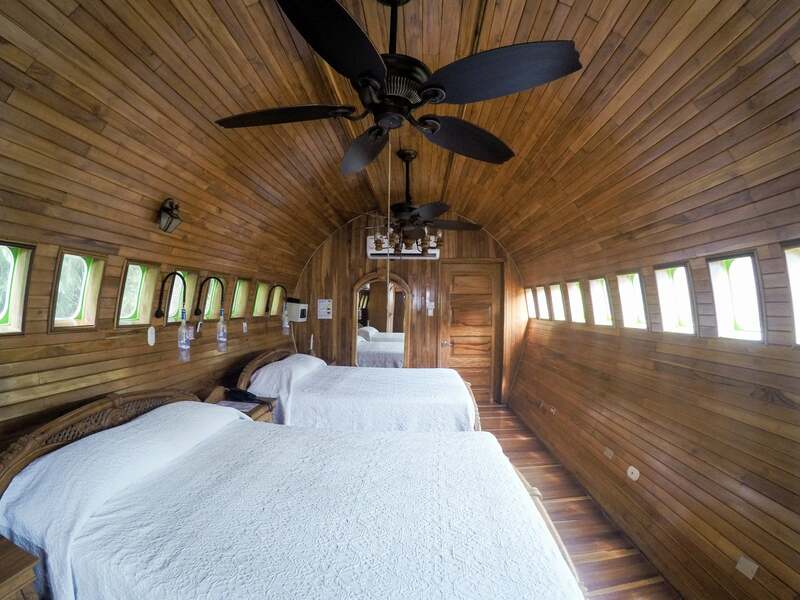 The plane was then reconstructed on a 50-foot pedestal in the jungle, complete with two decks. 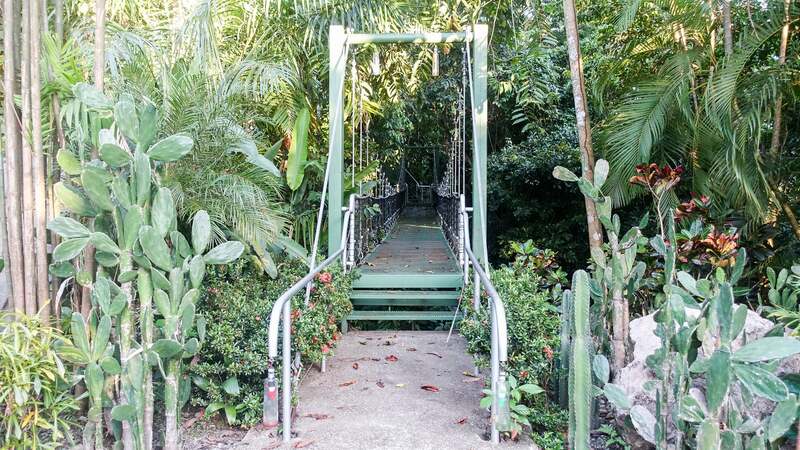 I found it surrounded by palm trees, hanging vines and plenty of other flora and fauna. After the quick uphill drive from the reception area, my mouth dropped when I first saw the suite. 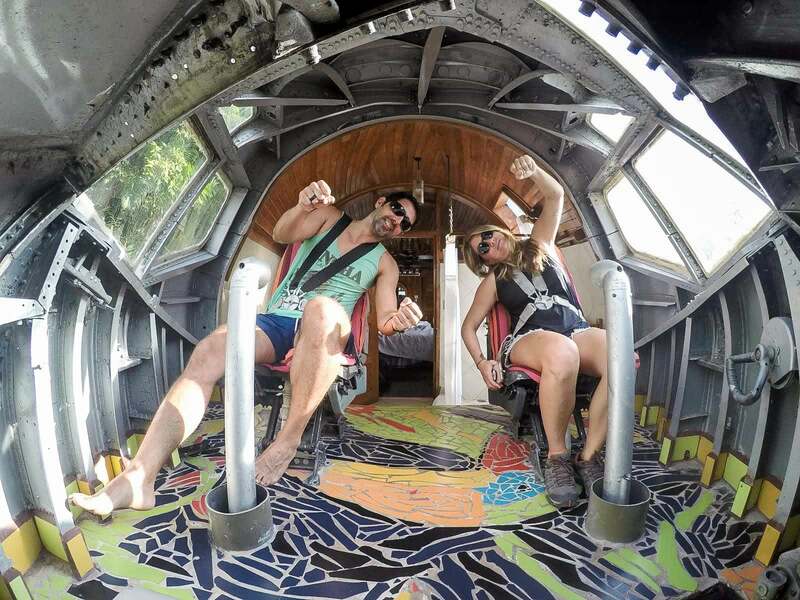 The wooden deck and door juxtaposed with the reflective, enormous metal jet was simply unlike anything I’d ever laid eyes on. I could feel the excitement rising as I entered the suite, which opened right into the dining room and kitchen. The suite was long, the full length of the plane. Although it was just my husband and me staying, you could easily fit a family or two couples. The bedrooms and bathrooms were on opposite ends of the plane, ideal for privacy. The back bedroom had a bathroom in the rear of the plane, and I found it creepy but also awesome to see all the inner workings of the tail from the shower. This bedroom led to a small kitchenette, though I really just used the full-size fridge to keep water chilled. I also used the coffeemaker each morning (Costa Rican coffee was restocked daily). 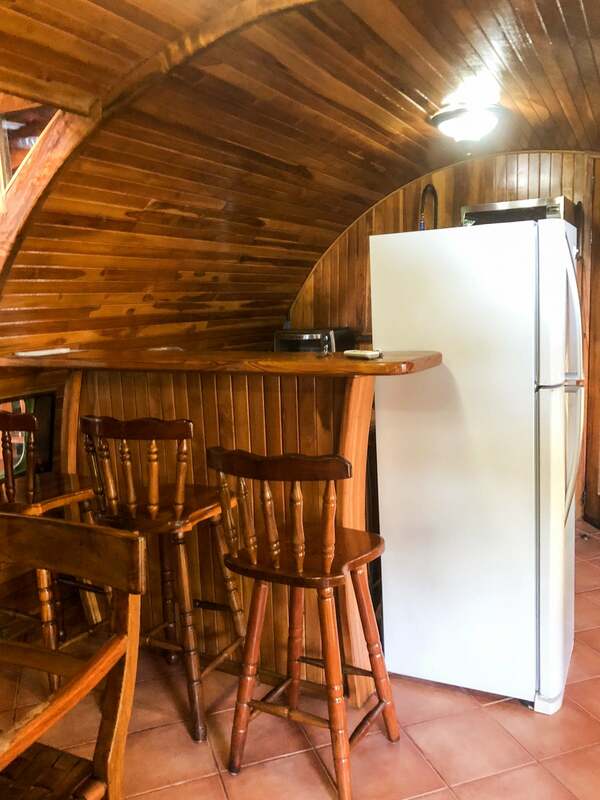 Past the dining room and wooden bar was a small living room with a round sofa and TV, followed by the other bedroom, complete with two large beds, wardrobes, nightstands and a safe. 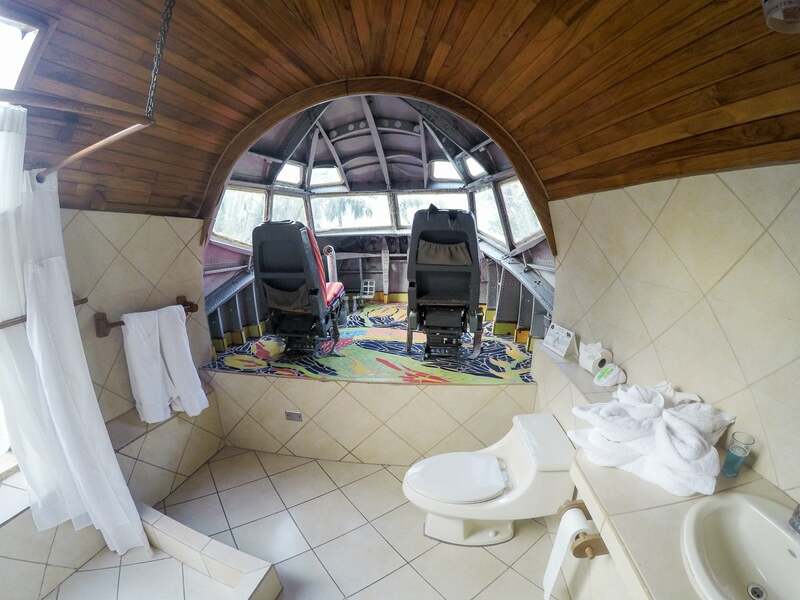 The cockpit was most impressive, and the fact that it was also the other bathroom was just quirky and fun. There’s nothing like showering in the cockpit of a plane! 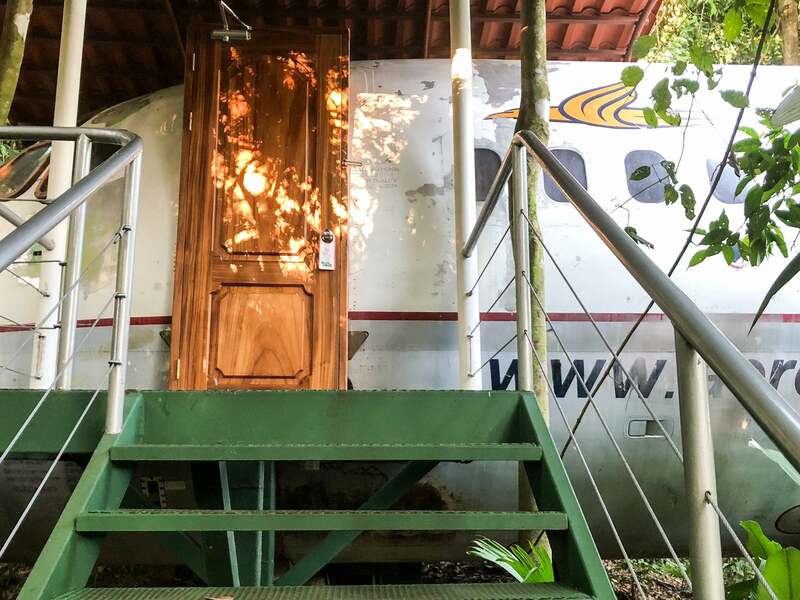 Emirates first-class showers definitely have some competition in this realm — especially considering the cockpit shower had both jungle and ocean views. Take that, Emirates! I obviously had to take a million photos of my husband and me pretending to operate the plane (I’m telling you, this experience will really bring out your inner child), but instead of boring you with the entire shoot, I’ll just include one so you can get an idea of how we spent an entire afternoon. The seats still had their seatbelts, and there was still some fun equipment up in the cockpit. 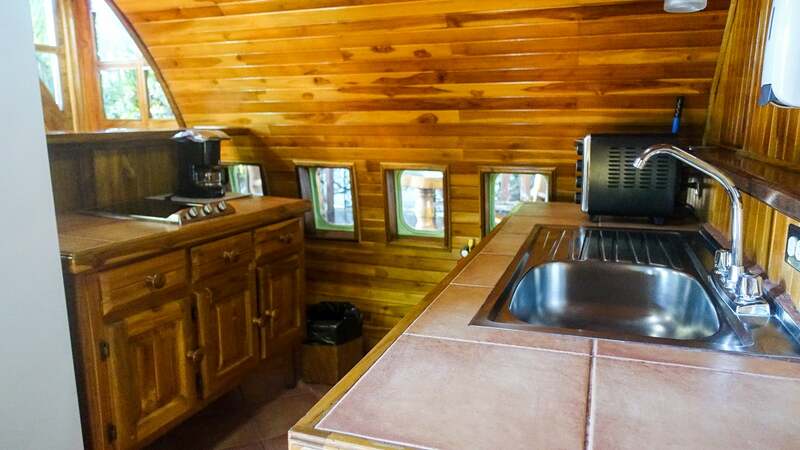 I imagine that the floor tiling probably wasn’t original, though you never know! 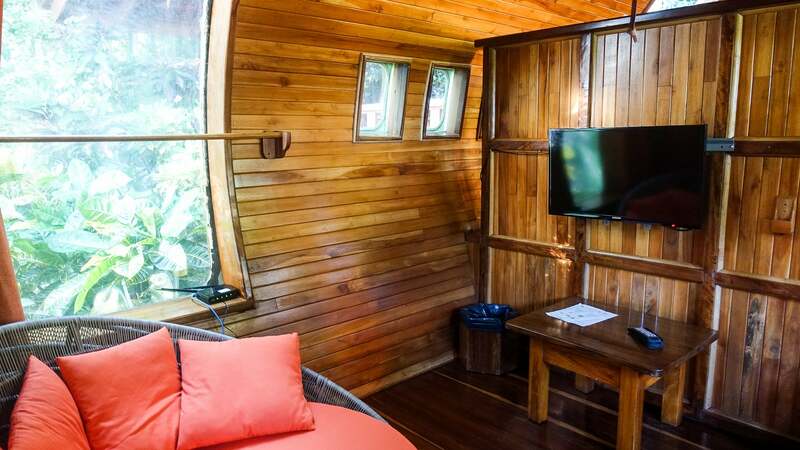 Although the furniture was dated and the decor had a very ’70s wooden vibe, what the suite lacked in modernity it made up for in originality. 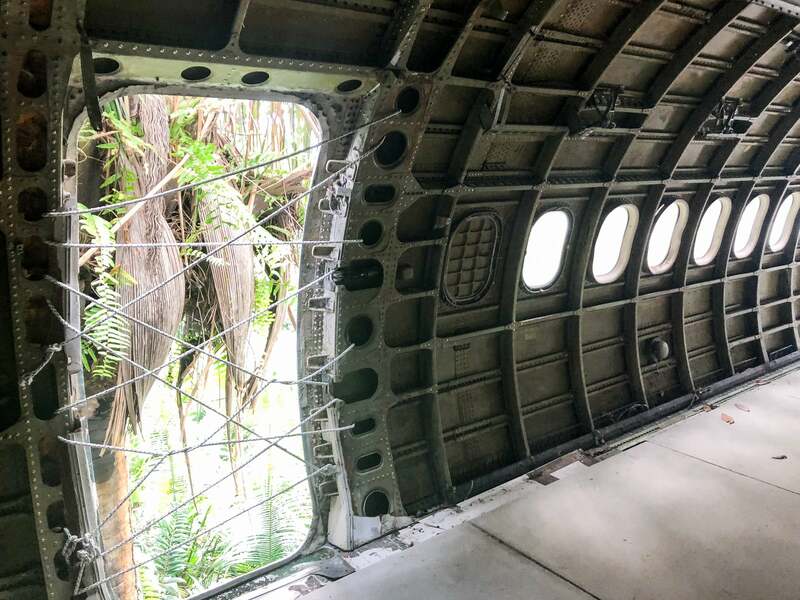 The windows were the typical aircraft windows (except sans shades), and the whole experience was just crazy — it really felt like a plane and a hotel all at the same time. 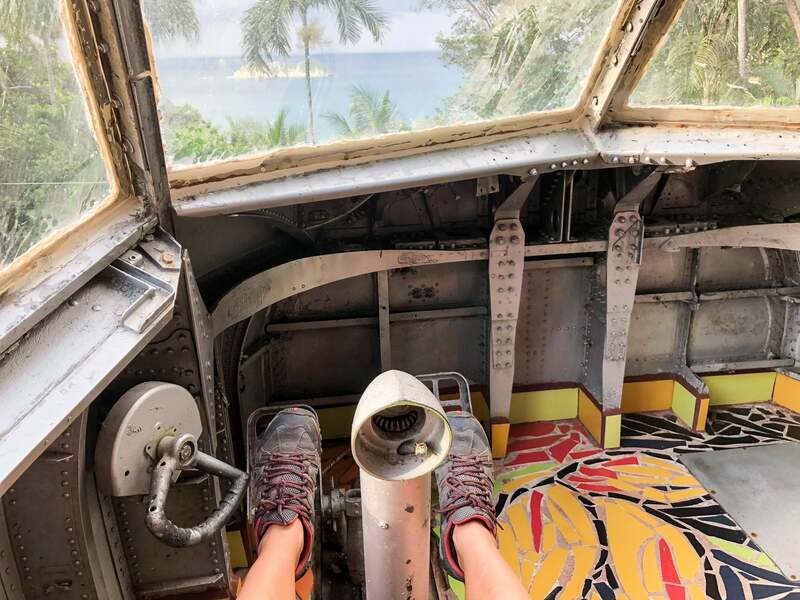 The two decks, specifically the rear one, were special places to admire not only the aircraft but also the stunning sunsets and jungle wildlife. 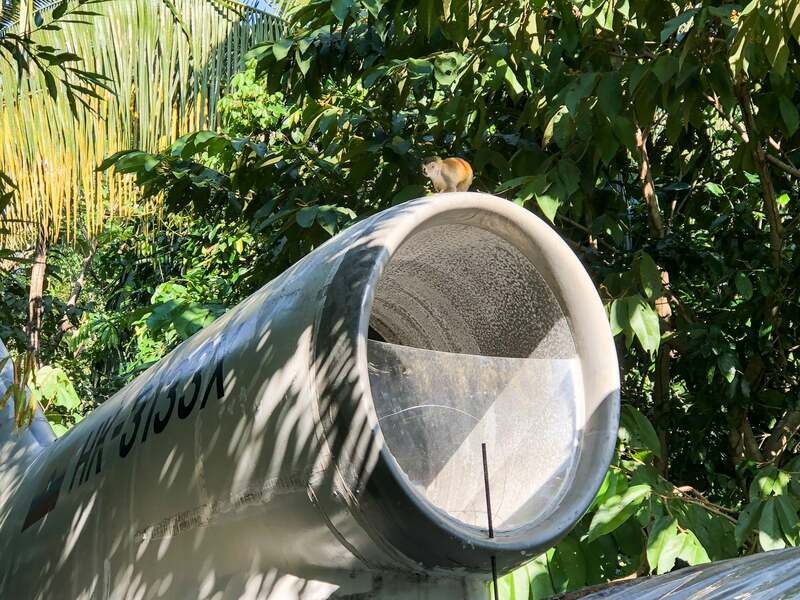 Seeing monkeys jump around and hop from palm trees to the deck and over and onto the plane was really just an incredible experience. Let’s play spot the monkey. The monkeys were harmless and had no fear of humans, though I wouldn’t feed or provoke them in any way. After all, I was basically on the grounds of a national park, and respecting the wildlife was important. The suite had air conditioning and fans, decently fast Wi-Fi and all the comforts you’d expect at a hotel — or maybe in first class. 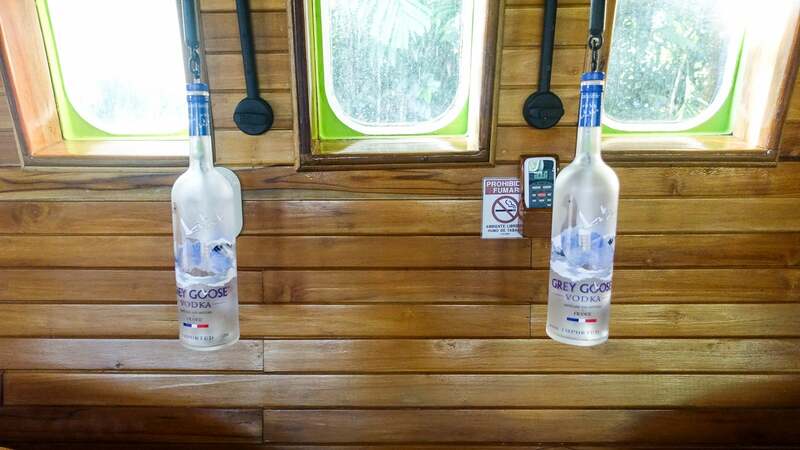 The light fixtures throughout the entire hotel were covered with old Grey Goose and Tanqueray bottles, which gave it… character. 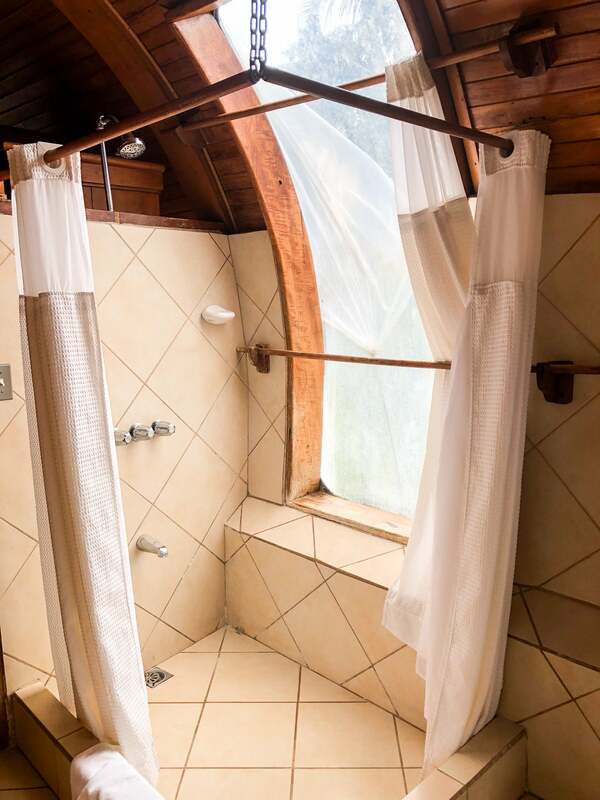 The bathrooms came with hair dryers and eco-friendly bath amenities. 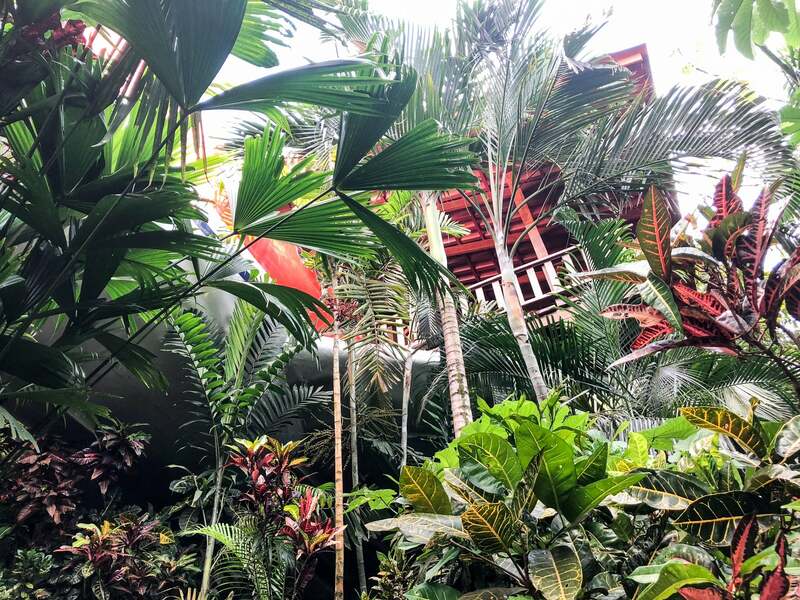 In fact, the entire hotel was dedicated to being sustainable (this is common in Costa Rica). One of my only complaints about the suite was that the wooden chairs weren’t very comfortable, especially if you wanted to spend time enjoying the deck. The safe was also too small to fit my laptop, but I secured it in my backpack and didn’t have any issues. Getting to the suite required going up and down stairs, so it’s not ideal for anyone with serious mobility issues. 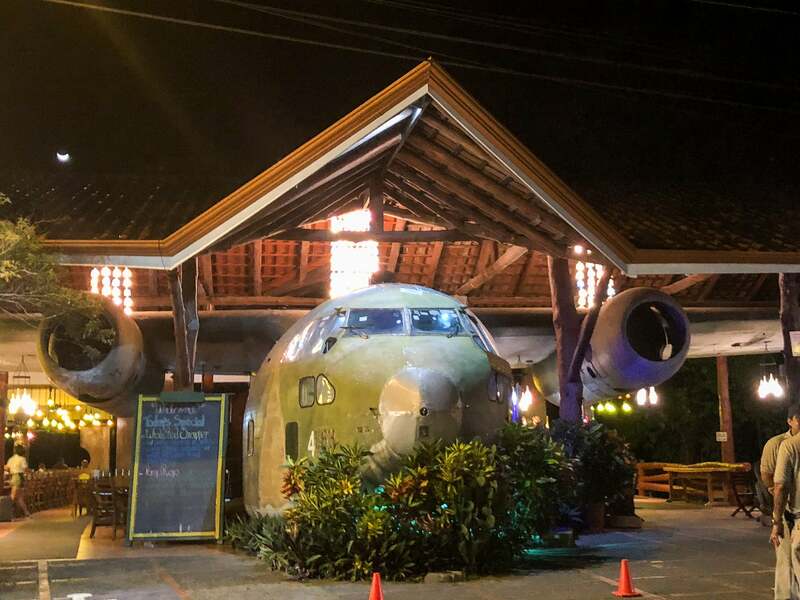 El Avion bar and restaurant. 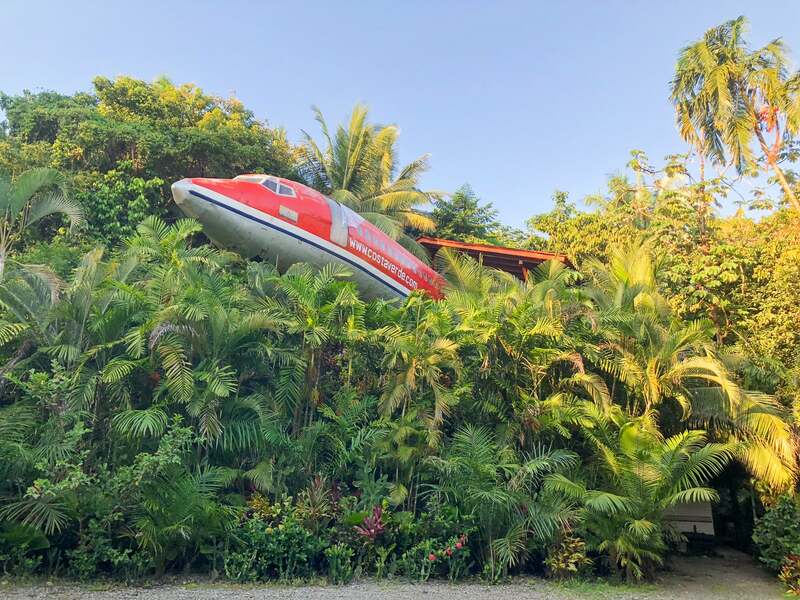 The on-site breakfast restaurant, Anaconda, was open from 6:30am to 2pm and had gorgeous sea views, as well as another old, empty plane that I was able to climb into and explore. The food was pretty standard, the coffee was very tasty, and prices were average for the area. 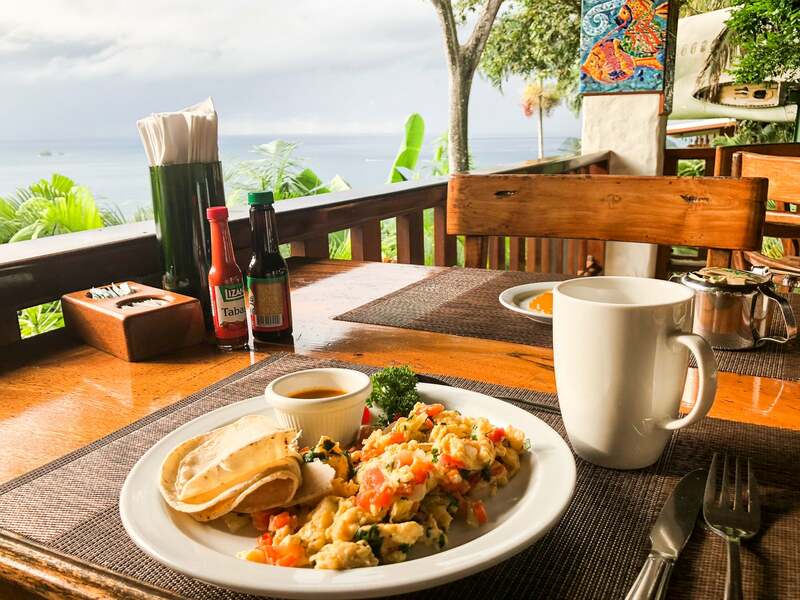 I enjoyed the Mexican breakfast, eggs and veggies in a spicy sauce with tortillas, as well as the gringo breakfast, eggs and bacon with banana bread and toast. 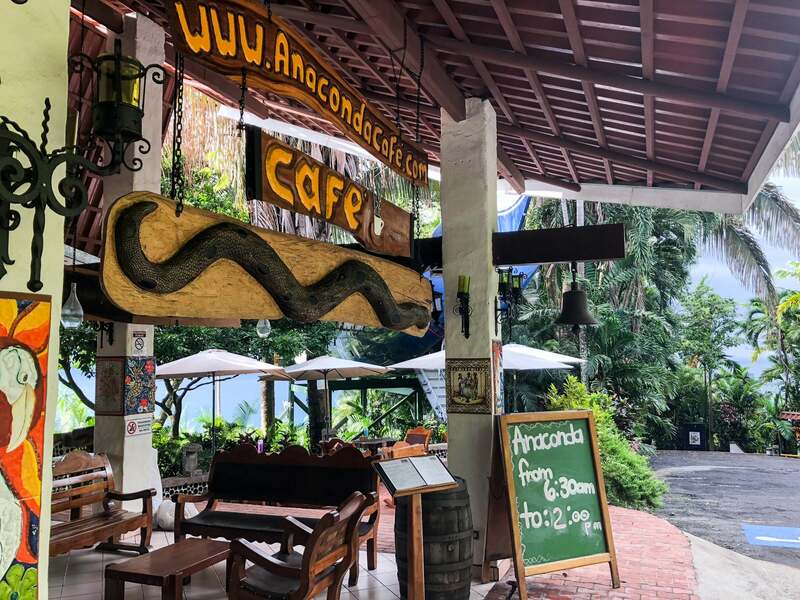 Anaconda also prepared sandwiches for you to take to the national park, since there were few options once inside for food. (You weren’t allowed to bring in any prepackaged snacks, just sandwiches and fruit, and they checked my bag before I entered.) 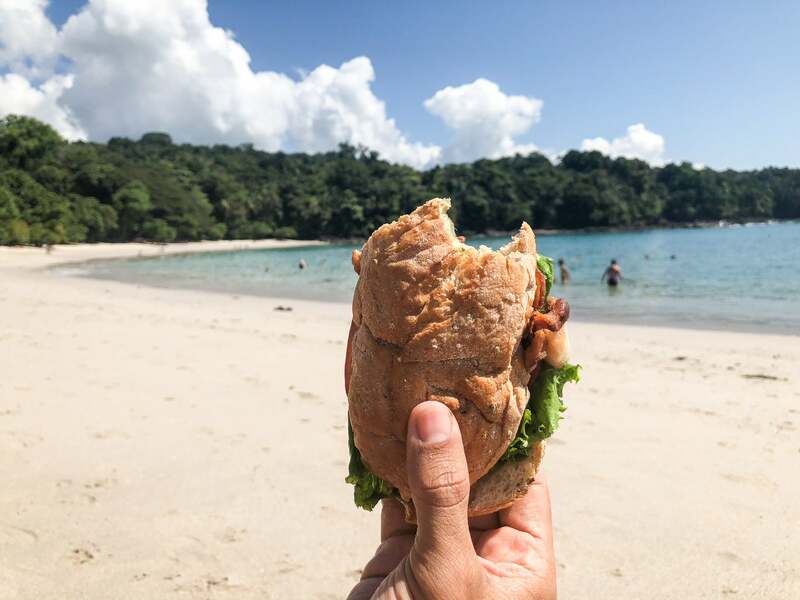 After a long morning of hiking, having BLTs on the beach really hit the spot. 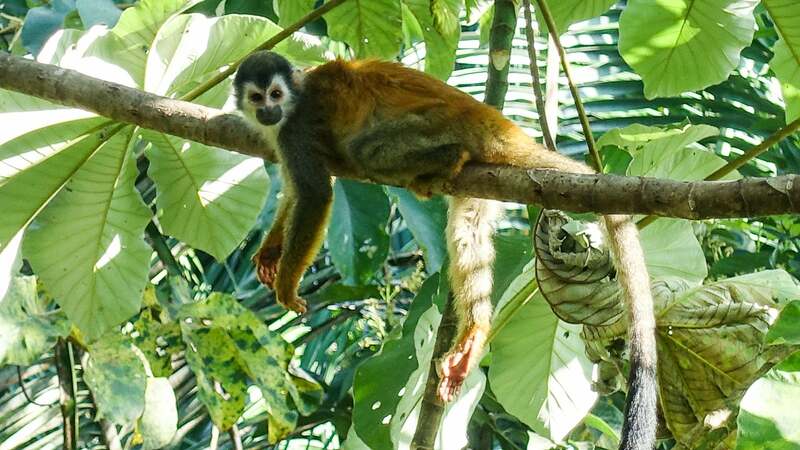 Just watch your bags, as mischievous monkeys love to steal food and towels — and they know how to open backpacks! 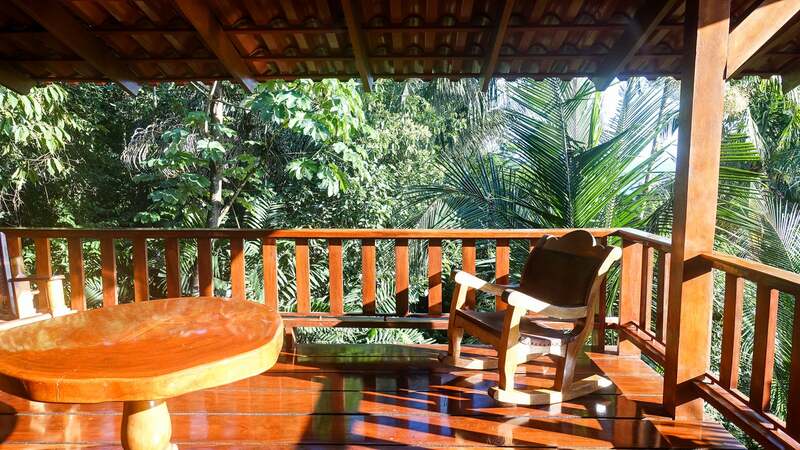 The hotel complex was huge, and the surrounding wildlife and jungle grounds were lush and impeccably kept. 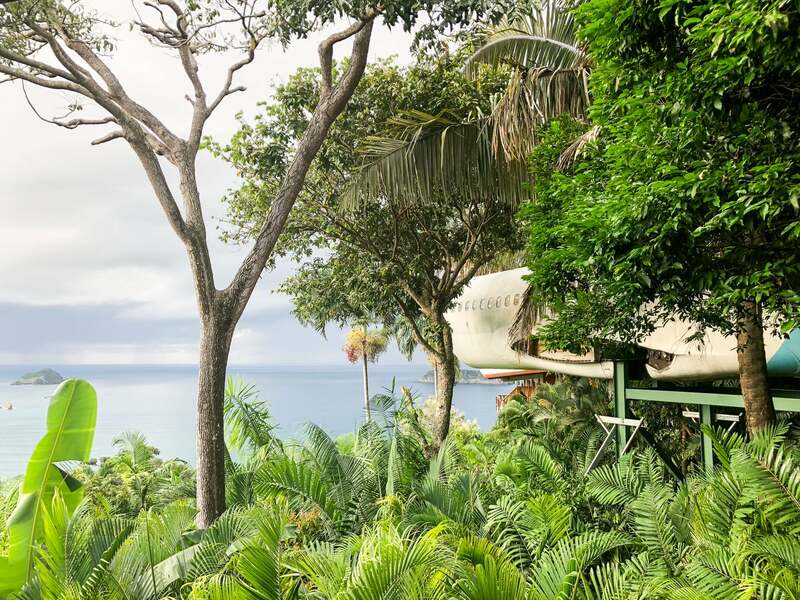 Is an on-site jungle perhaps the best amenity a hotel can offer? The reception staff was super friendly and helped us book tours, arranged laundry service, and offered rides to some of the restaurants the hotel owned off site, like El Avion, an aircraft-turned bar/restaurant; El Wagon, a restaurant inside an old train wagon; and La Cantina (these were walkable too). The hotel had three pools. I made my way to the adults-only pool, which was gorgeous. Although it wasn’t a chic, trendy infinity pool, the views were incredible. 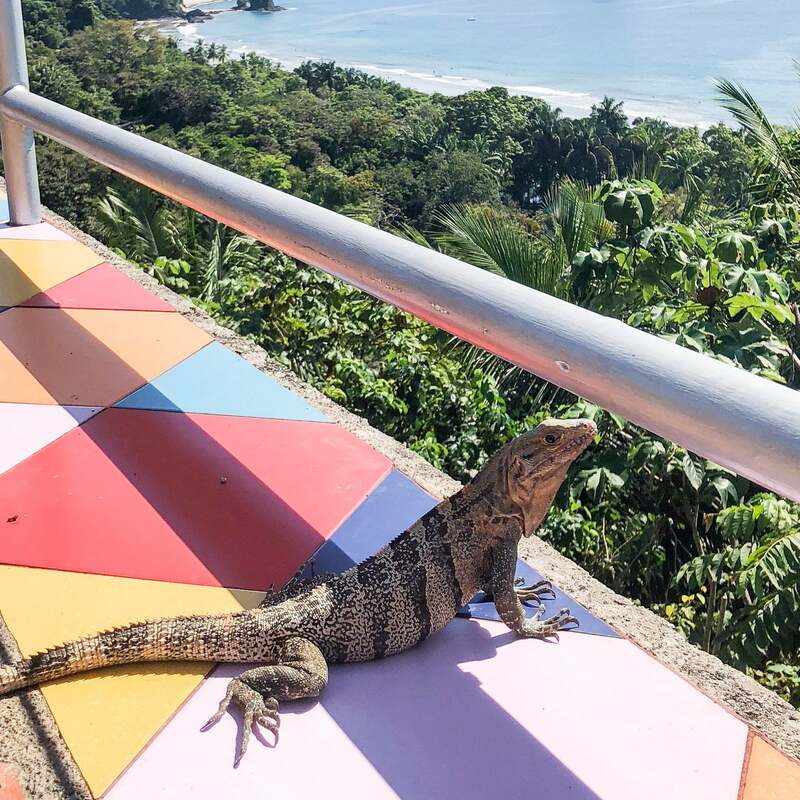 The chairs, though older, were comfortable, and I spotted several large lizards baking in the sun next to the cacti, admiring the view (who could blame them?). 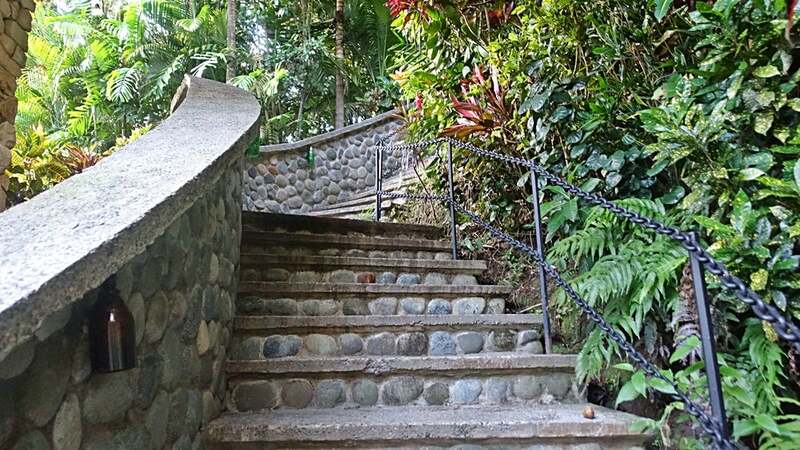 It was possible to walk down to the public beach and the national park, but the trek back up was uphill and tiring, especially after a day of hiking in the hot sun. The local bus was an easy and convenient alternative. 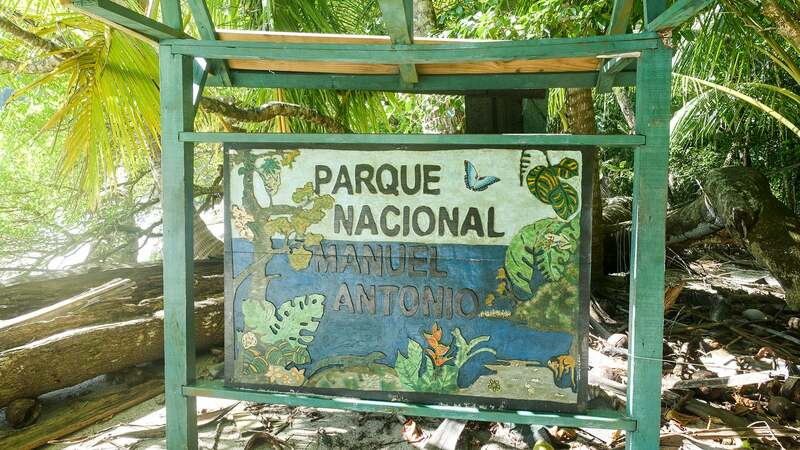 While I could have grabbed a taxi or Uber, I always enjoy trying public transport when I visit new places, so I picked up the bus at the public beach just outside of the park for a quick ride back up to the hotel, costing me 365 colones (about 60 cents) per person. It passed by every 20 minutes, so I didn’t have to wait long. I just pressed the button when I was ready to get off (right in front of the hotel). 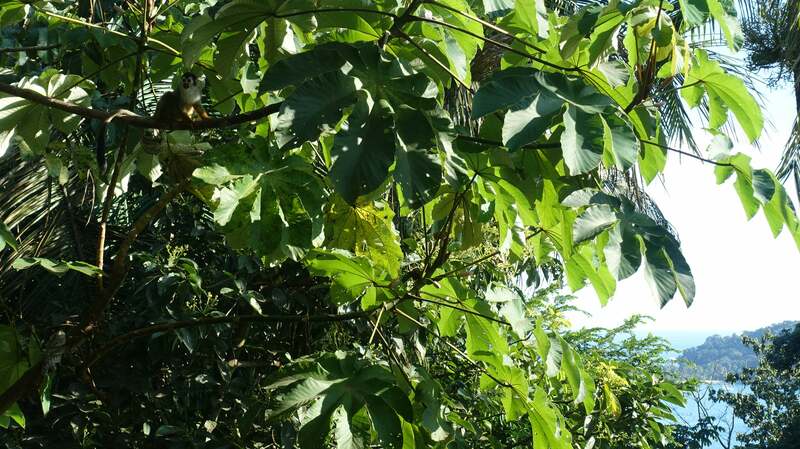 I even saw a sloth in the tree overlooking the bus stop, which was pretty impressive. 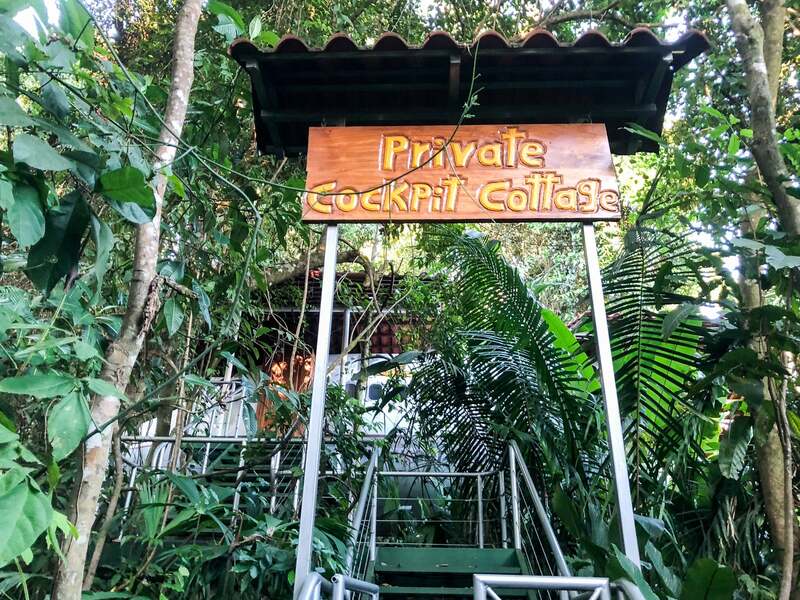 If you don’t like wildlife, this experience probably isn’t the place for you, although I will say that I was surprised at the lack of insects and mosquitoes inside the suite. I guess nothing really got through that metal, which was reassuring. 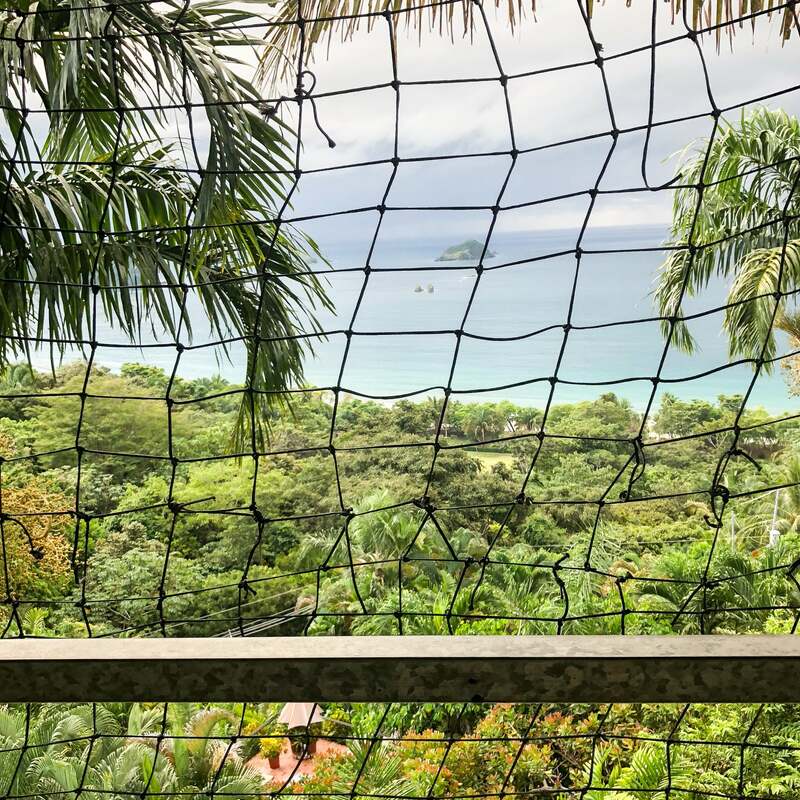 With a tagline of “more monkeys than people,” the Hotel Costa Verde is already a gorgeous place to stay if you love nature. 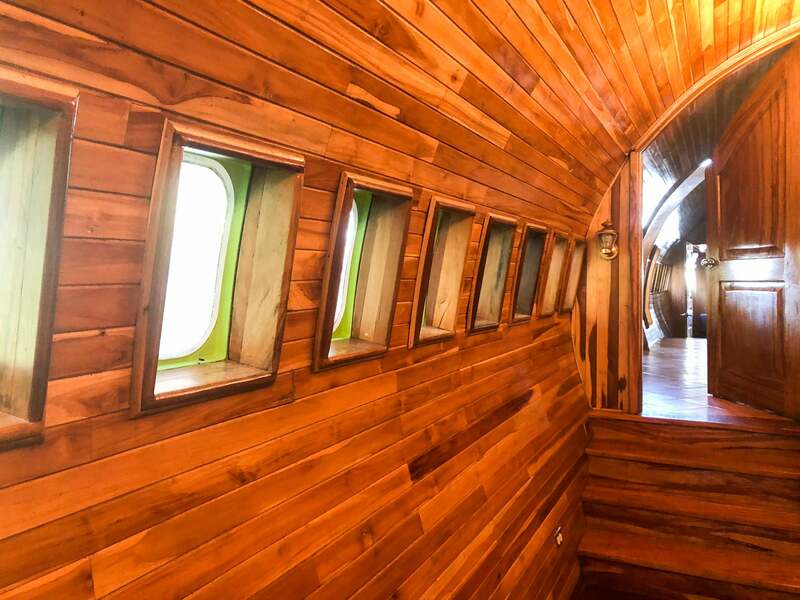 But adding in such a fun and uniquely designed room, the 727 Fuselage Suite, was icing on the cake. It’s important to note that while the suite was comfortable, it wasn’t a luxury or five-star hotel. 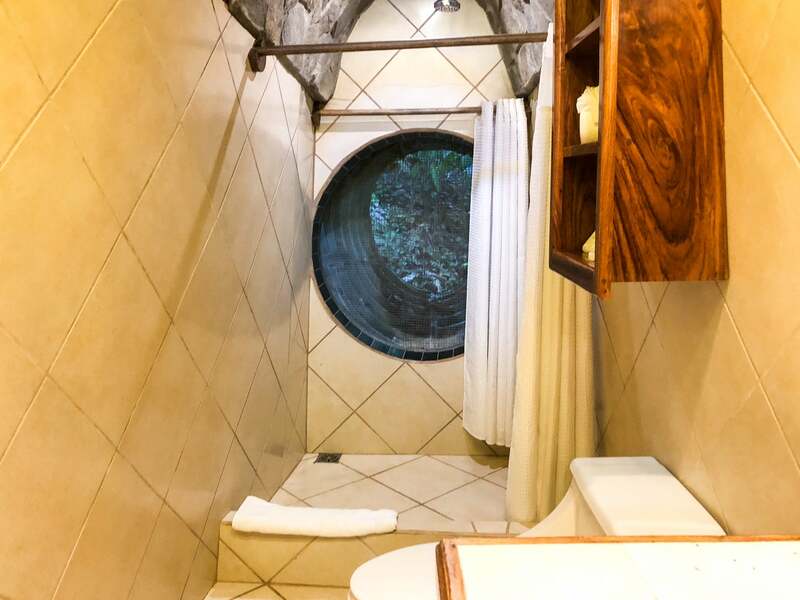 Since I wasn’t expecting that, I was thrilled with my unique hotel experience. Those in search of an exciting adventure who don’t mind a little wildlife should definitely give this place a try! All photos by the author for TPG.